Bronner by Sherri Burgess is an amazing, brutally honest book written by the mother of two and a half year old Bronner after he died. Sherri Burgess could be bitter but she isn’t. She writes to give God the glory. She is sad, she misses Bronner but she knows “Bronner hadn’t just ceased to exist, I knew he was somewhere.” Sherri Burgess is unbelievably positive. Her words and her attitude she accredits to God. He has helped her get to where she is today. He has been beside her every step of the way. Sherri Burgess tells of all the good that has happened since Bronner’s death. She realises looking back, that she was only meant to have Bronner a short time. He is God’s child that she just ‘borrowed’. She writes to point people to Jesus. She talks to point people to Jesus. 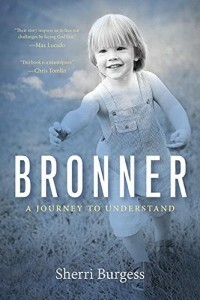 And she hopes that because of Bronner and the family’s closeness to God that more people will be in Heaven. I found the whole book incredibly uplifting and faith inspiring. Sherri Burgess states “it’s easy to worship God when He gives you everything you want… what’s hard is worshipping Him when He doesn’t.” How incredible is that? Life is all about putting God first. It is getting into His word. It is trusting Him with your children’s lives. “You can’t think your way to God. This is a matter of the heart.” And the heart that loves God and looks to God in all circumstances, can cope with life in partnership with Him. This book has the power to change lives. This book has the power to change hearts. This book has the power to change eternal destinations. This book needs to be read. God bless you Bronner. God bless your family. To God be the glory.